Jaime Acosta's Dojo to which I returned was in a small leased space in a dance school. Two times a week the karate class was preceded by jazz dance class, two other days the Sensei gave a Chi Kung class prior to ours. The floor was covered in linoleum, pliable but slippery and funky with sweat. 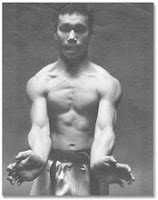 The dojo was under the Chi-I-Do organization run by Master Kow Loon Ong (Kayo). Kayo, as was the case with Kimo Wall, was previously in Toguchi's Shoreikan school, so basically the curriculum was the same. With some very important exceptions, Chi-I-Do in Puerto Rico was actually the old Kodokan sensei, who were before that the Shoreikan sensei. In other words, the core of instructors, senior students, and sensei dated back to the old Ochoa school. That was the continuum, a very crucial continuum to understanding Okinawan Goju Ryu in Puerto Rico. Through the years, the initial core of sensei and students remained basically the same. Chi-I-Do had four schools on the Island: the Las Cumbres, the San Lorenzo, Mayaguez, and Jaime Acosta's Dojo(actually an offshoot of Las Cumbres). No matter where they drifted or splintered off to, most Okinawa Goju practitioners had this same genealogy. This gave a uniformity in attitude if not style. We were all steeped in a very traditional and formal training atmosphere that remained constant whatever the organization that the dojos were linked to. I would venture to say that even within the Chi-I-Do organization, Puerto Rico was the most "old school" in dojo etiquette, dress, and other formalities.